This pdf clocks in at 2 pages and is a mini-dungeon. This means we get 2 pages content, including a solid map and all item/monster-stats hyperlinked and thus, absent from the pdf, with only deviations from the statblocks being noted for the GM. Oh, and the series now comes in an archive that also contains…*drumroll* a .jpg-version of the map, in both GM and player-friendly versions! 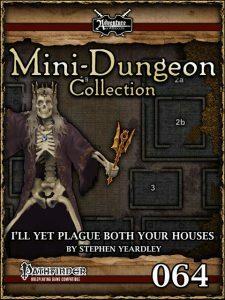 Stephen Yeardley knows how to write mini-dungeons; I am a huge fan of his big adventures as well as the small ones and this one is amazing due to its focus on pure functionality – we get a volatile, extended encounter-situation and ignite the powder-keg once more by adding PCs. The module can be slotted easily into just about any context and the author chooses the adversaries in a creative manner – from totenmasken to polong and guecubu, this excels in its smart creature choice and precise, challenging set-up. I really like it. My final verdict will clock in at 5 stars + seal of approval.